Color was on tap for the SOQS Donor Appreciation event. After checking the very cold temperatures at the door (yes – this was the Wednesday evening before the BIG snowfall), color and creativity greeted and warmed the guests. An exhibition of mixed media artwork – “4 Voices” sung out in bright hues, appetizers echoed colors of the rainbow – too attractive to consume (but somehow everyone managed! 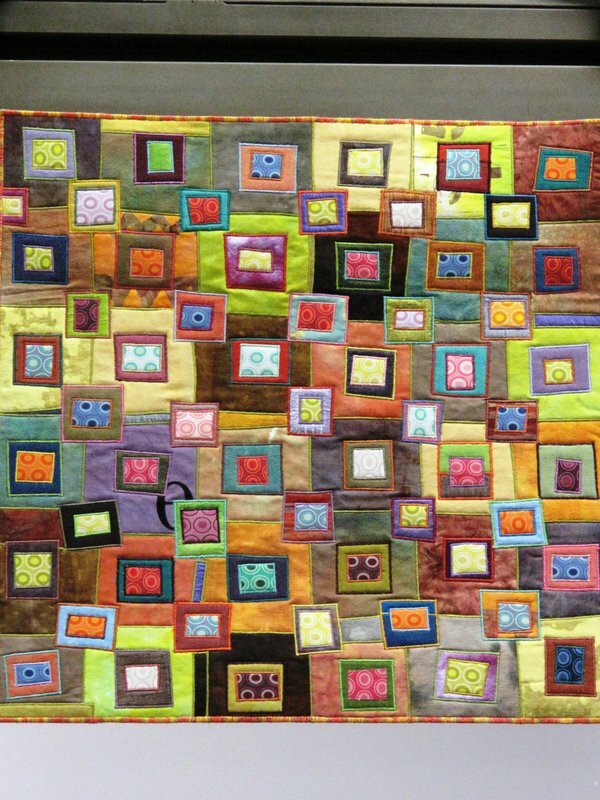 ), and the “Natural Affinity” quilt exhibit by Wendy Hill and Pat Pease bedazzled the eye. Wine, appetizers and ideas filled the first hour as guests shared with each other and viewed the artwork and quilts up close. Jeremy Storton’s soft music on guitar complimented the evening. 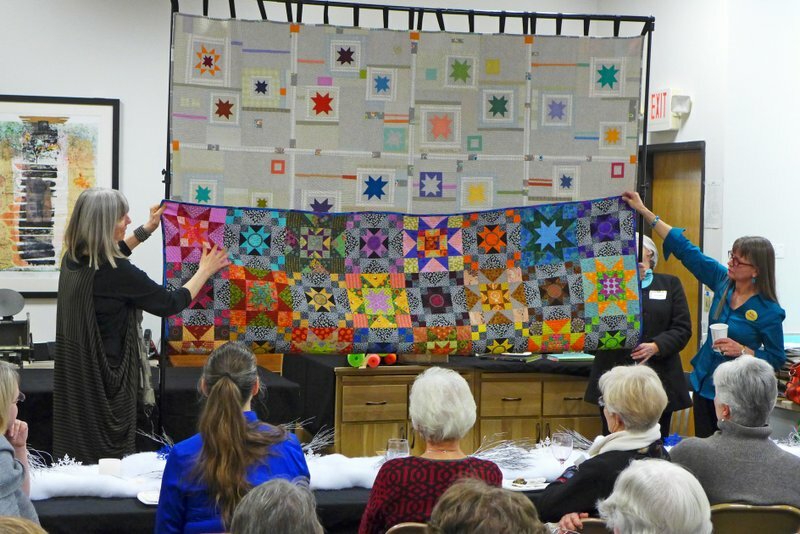 Color Blind and Color Blinded, a reversible king size quilt by Wendy Hill served as the backdrop for the evening’s presentation by Wendy and Pat. They shared their approach to design, their views on color and composition and their collaborative process. 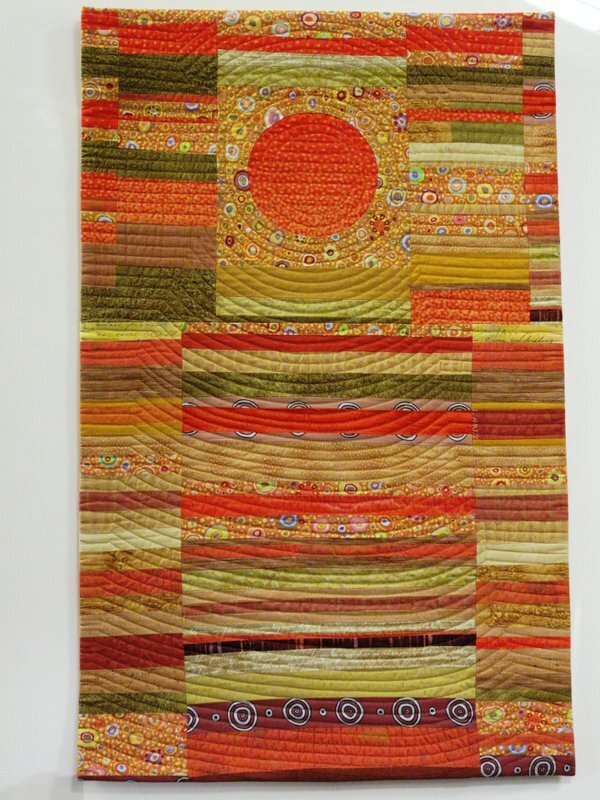 “Natural Affinity” was on display at Pacific International Quilt Festival this past fall. If you would like to see these quilts, they will be on display this summer at the Sisters Outdoor Quilt Show. To view a photo album of the evening’s festivities visit us on our Facebook page. Wish Upon A Card – Fabric Postcards For Silent Auction Selected	I Took the Challenge . . . . I am trying to reach Pat Pease and do not have a current email to do it. Pat had a quilt in an exhibit Art Inspired by Science at the Schenider Museum in 2010 and I produced a small book about the show and now we want to get permission from Pease to use an image of her StringTheory in an e-book version of that same book. My phone is 805-643-5034 and my email is rlchianese@gmail.com. I would apprecaite it if you could forward my inquiry to her.